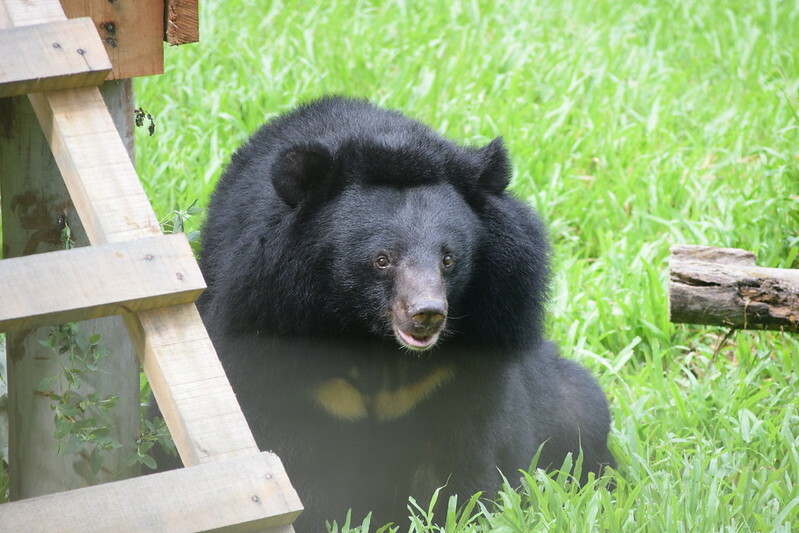 When moon bear Dieu was rescued from a bear bile farm in Vietnam’s Binh Duong province in 2017, she was utterly passive to everything around her. Her body was obese from an unsuitable diet, her belly was scarred from a poacher’s snare and her spine was permanently deformed leaving her incapable of lying down on her back. She must have felt as if nothing that was happening to her could possibly be worse than what came before. But she couldn’t have known that her rescue from that awful farm was a turning point in her life of unending misery. Since then, vets have treated Dieu’s injuries, she has once again felt the long-forgotten sensation of grass beneath her paws and has made forever friends with fellow bile farm survivor Soul. These two moon bears can often be found sharing a bunk together, finding solace in each other through long nights. The inseparable duo have temporarily moved to the sanctuary’s Miomojo Cub House. As neither was getting on particularly well with their old group, their carers decided it would be best to give them a new space before identifying a community which may suit them better. The Miomojo Cub House is also home to a community of sun bears ranging from three to nine years-old who live separately from Soul and Dieu. Animals Asia’s Vietnam Bear Rescue Centre is currently home to 175 rescued bears and has a maximum theoretical capacity of 200. With Animals Asia having signed an agreement last year with the Vietnam government to completely end bear bile farming and transfer every bile farm bear to sanctuary, every space created could represent another bear saved. “Since the move to their own enclosure in the cub house, both Soul and Dieu seem a lot happier, calmer and more confident. The old group wasn’t the best match, but they are such a lovely pair that I’m sure we can find the right fit for them.